For all the importance that Spider-Man’s symbiote costume came to play in his history, he wore it a surprisingly brief time in the classic Amazing Spider-Man comics. Barely six months passed between when the costume first appeared during the first Secret Wars mini-series and Mr. Fantastic determining it was an alien in Amazing Spider-Man #258. Yet later writers have continually said that Peter wore the costume for months in the Marvel Universe before discovering the truth behind his new threads. What makes this even stranger is what an odd time of life this was for Peter Parker. The eternal student was dropped out of college and not taking classes. His love life was also surprisingly stable, with Felicia Hardy (aka Black Cat) making an honest effort to get to know the Man behind the Spider and the two forming a crime-fighting partnership. Yet so little was done in this little period of time. Enter Symbiote Spider-Man #1 – a mini-series by long-time Spider-Man writer Peter David and artist Greg Land, that spins a tale set in this magic time and gives it some much needed definition. David’s script is well-researched, as his adaptations of other writers’ work tends to be. (I’m not a Trekkie, but I have it on good authority that Peter David’s Star Trek novels are the best around.) He repeats a running gag from the Tom DeFalco comics of the time where Peter complains about Black Cat crawling through his apartment window in costume. This time she honors his request and crawls through the window in her street clothes. There is humor, of course, this being a Spider-Man story. Yet David also takes the time to tug the heart-strings, with Peter taking Felicia with him to visit his Uncle Ben’s grave as part of a day together as their civilian selves. This leads to a brief but magical scene where Felicia meets Aunt May – something I don’t think has ever happened in any comic story ever – and part of me wishes we had gotten to hear more of that conversation. Ah, but what of the action and the actual plot? Surely this isn’t all slice-of-life dramedy? No, it isn’t. And in may ways this issue belongs just as much to the villain Mysterio as it does Spider-Man. Again, David finds a way to put a twist on a classic formula, with Mysterio looking to make one final score for a surprising reason and finding his whole life in upheaval. I can’t say more than that, but fans who remember Mysterio’s characterization before his death will see his portrayal here is a logical step between the colorful con-man from Stan Lee’s run and the madman desperate for legitimacy in his later years. As for the artwork, I must say that it is typical of Greg Land yet better than I expected. Once upon a time Land was a highly-sought after artist at both Marvel and DC. Unfortunately, somewhere along the line, Land began tracing photos to create his artwork to meet deadlines and some of those photos were of a… shall we say, risque nature? While he was drummed out of the industry at large for a time, he still manages to score the occasional cover-gig or mini-series assignment at Marvel. There’s more than a few of Land’s infamous panels of women with their mouths wide open in shock and forced poses that have no relation to the dialogue of the scene. While this is thankfully limited to Felicia and her hair is the same length and style throughout the issue (a frequent problem in earlier Land comics was the female lead’s hairstyles changing from panel to panel), her general appearance seems incongruous to the rest of the characters Again, I have to say that Land could be a great artist if he would quit being so lazy when it comes to drawing young women. The rest of the artwork is proof of that. 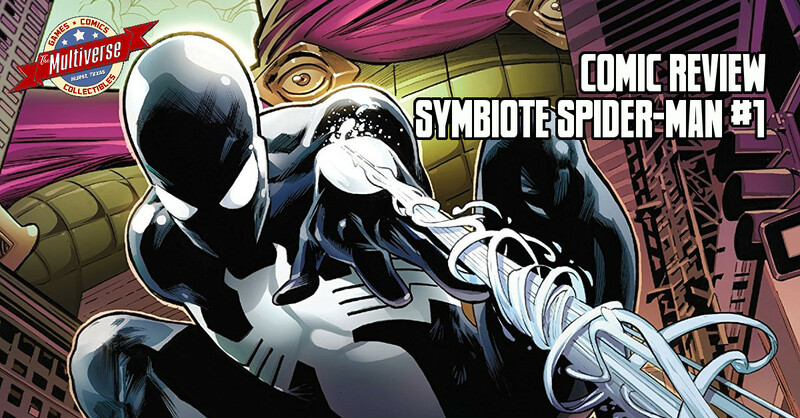 Symbiote Spider-Man will be a welcome treat for Spider-Fans and lovers of Peter David’s writing. Your mileage may vary on if it is worth dealing with Greg Land’s eccentrics for the sake of a good story. Personally, I think it is, but his work here is nowhere near as painfully posed as his infamous run on Ultimate Power. That’s a low bar, I admit, but the artwork here reminds me of the Greg Land on Birds Of Prey 20 years ago who got me into comics in the first place. Symbiote Spider-Man #1 releases on April 10, 2019!